Will this be the end of hyper-powerful 3D gaming cards as we know it? 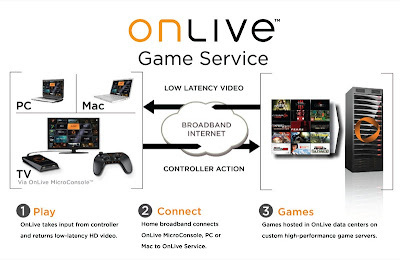 If OnLive delivers, it may very will be a turning point in the gaming industry. They claim to be able to stream video games into your house, but in a slightly different way than you'd might expect. 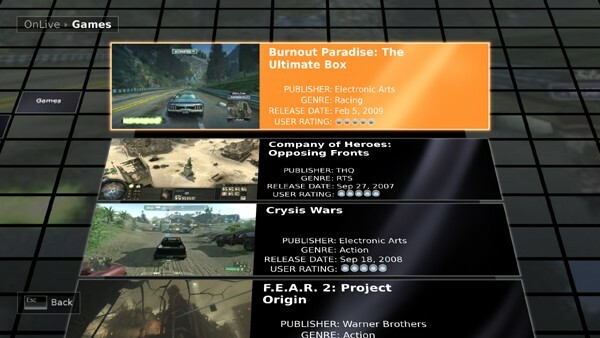 Instead of transferring the game so it can be played in your computer, they'll be streaming realtime interactive video. Meaning, no matter how old your computer is, you'll be able to play the latest and greatest 3D games with all the high quality details turned on. Playing Crysys on your Eee PC won't be a problem anymore. A more critical aspect of all this is the low latency connection required. As everything you do must be sent to the remote server, processed, rendered, and then streamed back to your computer - this round trip must be done as quickly as possible. I've been telling my friends that this day would come - I just didn't exepect it would arrive this soon.